The Rink at Rockefeller Center is already open, and another Christmas mainstay is making its way to the bustling midtown plaza as we speak. The massive conifer pictured above is being trucked down to New York City today; it was cut down this morning in Shelton, Connecticut. 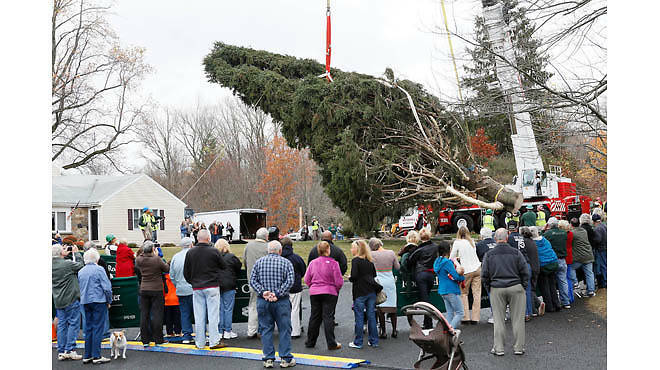 The tree in question is a 76-foot-tall Norway spruce donated by the Vargoshe family. Rockefeller Center is posting lots of photos of its journey to the Big Apple; check them out via Twitter. The Rockefeller Center Tree Lighting ceremony is happening December 4, but if you'd rather check out the evergreen when the crowds have abated slightly (which will be never, but we digress), it will remain illuminated with thousands of LED lights until January 7.